Day 1 of Sisters by Nancy Cucci | NJNA is Blogging! Did you think I made a mistake? Yes, this is my second class with Nancy at this seminar as these were my two favorite pieces of the offerings that I saw last year. Nancy told us a story of visiting her best childhood friend, who had remained a lifelong friend, a few years ago in Iowa, half a continent away from where Nancy lived. While seeing her friend, they visited the friend’s sister where Nancy saw a metal wall sculpture of interlocking squares that she liked. A photo of this led her to the eventual design of this piece. The name comes from the association of her friend, the photo at the friend’s sister’s home and Nancy’s feeling that her best friend was like a sister to her. I like the story behind this beautiful design. This piece of peach, aqua, and grey blocks is interesting as you will eventually see because all the small units are the same in each block but rotated. We learned all but one component of the block that is foremost in the design today so we can transfer that knowledge to the remaining blocks when we return home. Each section has beads that will be added and the missing block on the right will be just beads and stitched when we are fresh tomorrow morning. I opted to wait until I am home to stitch the beads in the other sections. Doesn’t this look like a pieced quilt block? Nancy explained that this was her concept of the overall blocks, so there are no borders within the block but there is a Kreinik double border around it. 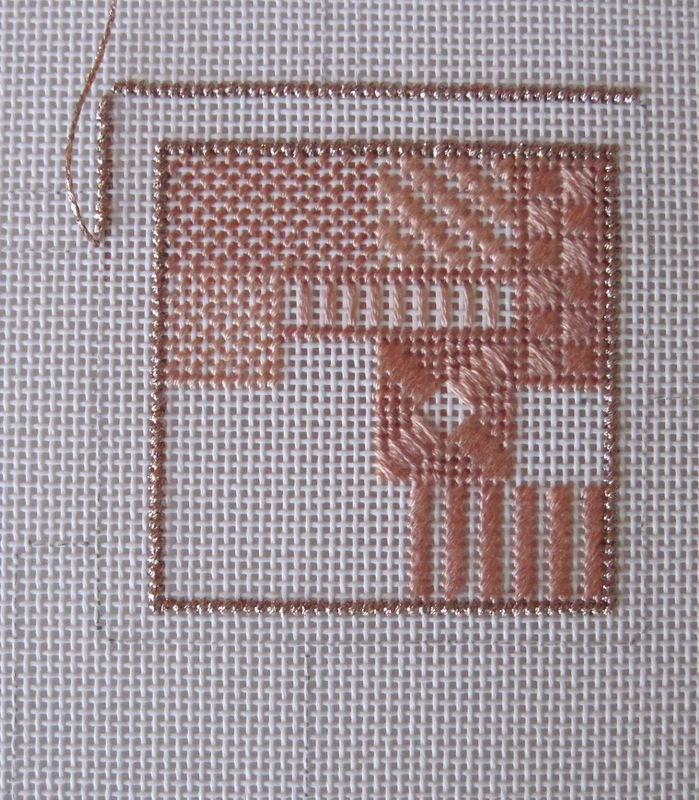 This block has two shades of peach as well as a Kreinik and a variety of beads coming. I am looking forward to more stitching on it tomorrow.